It seems Neel is missing home cooked food as he has been requesting me time and again to give him the exact recipe for shrikhand. Exact recipe, how is that possible? I learnt how to make shrikhand from Nunu my mother in law but I never bothered to ask her for the exact measurements. However, I just learnt how to make it as it was a very popular dish in our family. It is Nunu­­­’s favourite and the kids too love it. Well Neel, since I have started writing the blog, my jikoni is not just for cooking but also a place where I am measuring every ingredient I use for the recipes. 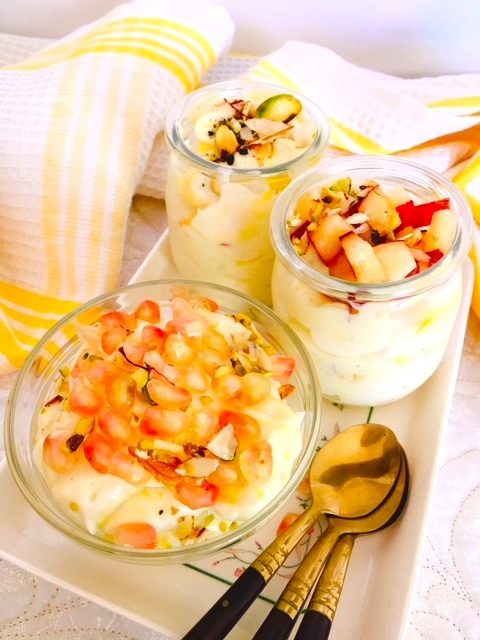 Over the weekend, I made the shrikhand and measured all the ingredients just for you. Its very easy to make. In my opinion it is not just another indian sweet dish but could be served as a dessert if you are innovative. All those who get greek yogurt in the shops can use that. Unfortunately, the shops here do not sell greek yogurt so I have to make the yogurt at home to make the shrikhand. Shop bought normal or plain yogurt tends to be a bit too sour. Since I first made the shrikhand to measure out the ingredients for my son, I’ve made it every time I’ve visited Montreal. I love to use Greek Yogurt and I just need to add it in the muslin cloth for 20-30 minutes and what ever little water is present comes out. I’ve served it plain with just cardamom, nutmeg and saffron or by adding a variety of fruits. If you’re in Kenya and you don’t have homemade yogurt, use plain Bio brand yogurt. It’s quite thick and not sour at all. Makes shrikhand in a jiffy. *I’ve not been paid by Bio to advertisement their brand. for 2­­­­­- a very generous helping and 3 if you feel like sharing. Put the yogurt onto a clean thin muslin or cotton cloth which you have draped over a sieve or small plastic basket. Cover the yogurt with the cloth. Place a wad of newspaper on the cloth. Place some heavy object on it, like a clean stone, brick, mortar etc whatever you have in the house. Leave it for about 30 mins. All the water from the yogurt will drain out to give you a nice thick curd cheese. Heat about a teaspoon of milk and soak the saffron in it. Remove the curd cheese from the cloth and put it into a bowl. Usually from 1 litre we get approximately 2 cups of curd cheese. Add sugar to the curd cheese or strained yogurt. Mix well with a hand blender till the mixture is smooth. Add the cardamom, nutmeg and saffron and mix well. The mixture will catch the saffron colour after a while. Can either sprinkle the nuts on top or mix it in the mixture. Whichever you prefer. Tastes good also with walnuts. Tastes best when it is cold, just out of the fridge. To serve as a dessert, can mix in fresh fruits like mangoes, grapes, pomegranate, tangerine, strawberries. basically any fruit of our choice. Add these fruits just before serving. For diabetics or calorie conscious people, you can add artificial sweeteners or stevia. You can adjust the amount of sugar according to your taste. Looks amazing…am definitely going to try this. If mine looks anything like this, Chet will be shocked!